Amyris oil or ' Westindian sandal wood oil' is obtained by steam distillation of the wood from this tree belonging to the rue family. It grows in the Caribbean area and along the Gulf of Mexico. The oil has nothing to do with sandalwood oil, the odour is different and not nearly as attractive, although it is pleasantly woody with a balsamic touch. 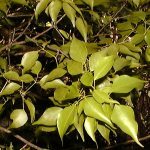 It is much cheaper than sandalwood oil and is used as a fixative in perfumes. 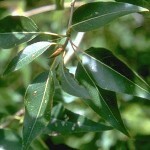 Amyris oil is rich in sesquiterpene alcohols (over 80 %), e.g. valerianol, eudesmol and elemol . 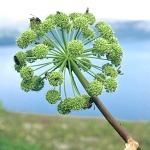 Angelica is a stout umbellifer, about a meter high, the leaves with much dilated, clasping bases and the umbels being almost spherical. 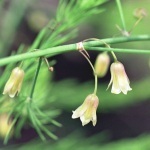 It is an old Nordic domestic plant, beloved as told by its name. In Norway, for example, it grows beautifully in the mountains near ice and melt-water. 12-methyl-13-tridecanolide . If you squeeze a few seeds between your fingers and wait for a moment, the fine fragrance of these macrocyclic lactones will appear. 15-Pentadecanolide is one of the most important musks in perfumery. Today it is made by organic chemical synthesis by the Swiss company Firmenich under the trade name Exaltolide ®. 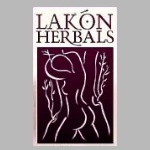 It is widely used as a fixative and a synergist, mostly in low concentration (< 5 %) where its influence is discrete but effective. 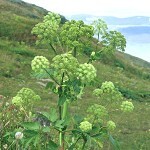 Natural oil of angelica is used in the liqueur Chartreuse. In Denmark, Sweden and Norway angelica is also called kvan. 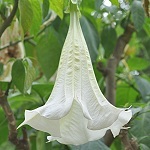 The Brugmansias of the nightshade family are woody trees or bushes from subtropical South America. They are often cultured in greenhouses in temperate zones and placed outside as ornamentals in the summertime - as in the Danish amusement park "Tivoli" where the upper photos were taken. 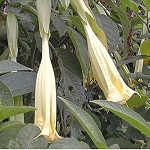 The name "Angel's Trumpet" refers to the large (about 30 cm long), pendulous, trumpet-shaped flowers. 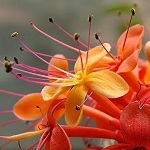 In their native countries the flowers are pollinated by hummingbirds and sphingid moths. 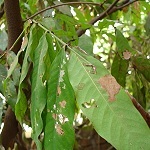 The whole plant, including the irregular seeds (lower photo), is poisonous from tropane alkaloids like hyoscyamine and scopolamine . In the evening, the flowers of B. suaveolens emit a light and powerful scent of lemony-creamy-rosy character. Stashenko et al. investigated the volatiles from these flowers in vivo by HS-SPME and GC-MS analysis. The principal components were 1,8-cineol, (Z)-beta-ocimene, beta-myrcene, citronellol, citronellal, alpha-thujene, terpinen-4-ol and its acetate, nerol, neral and geranial (citral) . Another study by Anthony et al. also found nerolidol, alpha-terpineol and phenethyl alcohol to be present . Etymology: Brugmansia, after the Dutch naturalist Sebald Justinus Brugmans (1752-1822). Lat. suaveolens, sweetly scented. Anise, probably a native of Asia Minor, has been cultured since antiquity. 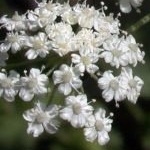 It is a slender annual umbellifer with small white flowers (enlarged on the photo). 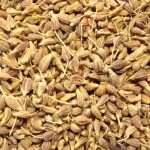 Anise oil is steam distilled from the seeds. It is a colourless or slightly yellow liquid with a powerful odour characteristic of (E)-anethole, which is present at a concentration of 87-94 % . Anise oil is a classical ingredient in several types of brandy and liqueur - Anisette, Pernod, Ricard, Ouzo, Arak, Sambuca, etc. Anise brandy contains fairly high levels of anise oil. When mixed with water it becomes turbid, because the lowered alcohol concentration makes the anise oil insoluble, precipitating as an emulsion. Eventually the oil will coalesce into droplets at the surface. Anise oil is so often used as a flavour in liquorice sweets that most people will say that anise oil smells of liquorice in spite of the fact that it is the other way about. Anise oil was formerly produced in many countries, mainly in eastern Europe, but it has now been largely replaced by the less expensive star anise oil, which also contains a high percentage of anethole. See also sweet cicely. 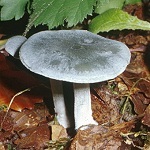 Distinctive odors have long been used as taxonomic markers for mushroom species identification. Clitocybe odora, a widely distributed mushroom in temperate zones, smells strongly of anisaldehyde (81 % of hydrodistillate). 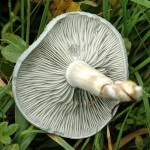 Actually anisaldehyde has a sweeter and more hawthorn-like odor than aniseed oil (in which anethole is the main ingredient), so the common name for this mushroom is a bit misleading. Secondary odorants in C. odora are benzaldehyde and 3-octanone; anethole is absent . Mushroom species could represent a valuable source of aromatic molecules for the flavor industry. 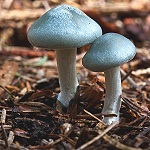 C. odora offers promise for anisaldehyde production using basidiomycota. other parts of temperate Asia. Today apricot is cultured all around the globe where climate is favorable (the upper left photo is from China, the right one is from Parga, Greece). Apricot comes in several cultivars. 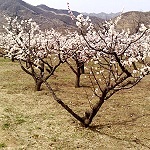 Unlike peach, apricot has white flowers in full bloom. 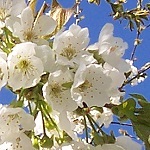 The characteristic apricot aroma has been subject to several investigations. 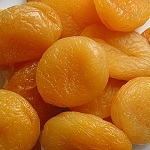 In a newer study Greger and Schieberle characterized the key aroma compounds in fresh apricots. They found that (R)-gamma-decalactone, (E)-beta-damascenone, delta-decalactone and (R)/(S)-linalool had the highest flavor dilution factors. Among the compounds with odor activity values > 100 (OAV = concentration / olfactory threshold value) two additional constituents previously unknown in apricot, (E,Z)-2,6-nonadienal (cucumber aldehyde) and (Z)-1,5-octadien-3-one, turned out to be key contributors . 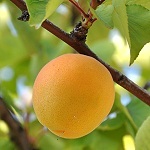 A previous study by Guichard showed that hexyl acetate and (R)-gamma-octalactone are also key aroma compounds in apricot . 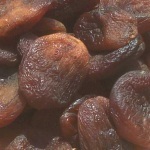 Dried apricots are a major commercial item. During the drying process glycosidically bound aroma compounds are liberated and browning reactions takes place, changing the aroma profile. Sulfur dioxide ("sulfite") is commonly used to prevent browning and as an antimicrobial agent. However, sulfur dioxide itself contributes an off-flavor. By careful drying and clever packaging, untreated dried apricots of superior quality are now becoming more available (last photo). Etymology: Lat. Prunus, plum; Lat. armeniaca, from Armenia, as apricot was formerly supposed to be native to Armenia. chalky ground. 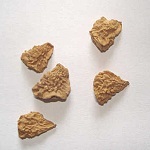 It has its natural range from Central Europe through western Asia. Hazelwort is a ground-covering perennial with kidney-shaped shiny leaves in pairs from each segment of the rhizome. From April to May a single unimpressive flower opens between the leaves just above the ground. It is brownish-green on the outside and purple inside. In gardens hazelwort may be utilized as a beautiful cover in shady areas. The whole plant and especially the rhizome has a characteristic peppery-aromatic odor when broken due to an essential oil whose major constituents are (E)-asarone (59 %) and bornyl acetate (7 %) . Moreover the sesquiterpene ketone furopelargone A, which is also known from geranium oil, is present . The phenol ether (E)-asarone (m.p. 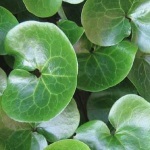 62 °C) may be crystallized from the oil and was formerly called "asarum camphor". In earlier times hazelwort was a renowned medicinal plant. It is said that the dried and powdered rhizomes are still used as an aromatic ingredient ("snakeroot") in certain types of tobacco snuff. Etymology: Lat. 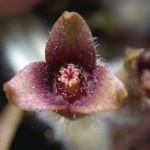 Asarum, from Gr. asé, nausea or disgust, because of the toxic effect of the essential oil when ingested in larger amounts. 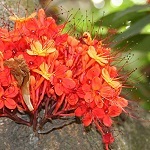 This sacred tree of the Hindus and Buddhists has flowers emanating a "very diffusive and far-reaching scent bringing to mind a delightful combination of lily and freesia, accompanied by a shade of orange blossom", according to the famous fragrance chemist Roman Kaiser. Careful headspace analysis by Roman Kaiser's group identified more than 80 ingredients in the scent of the flowers and revealed that "the very crisp and clean lily note" was due to a combination of salicylates with (Z)-4-hepten-2-yl salicylate as a significant element. This new natural compound surprises with an "appealing and transparent floral-green odor"   . Asparagus is a perennial herb with strongly reduced leaves that are small and pellicle-like. Instead the needle-shaped, finely branching twigs arranged in bunches have completely taken over the task of photosynthesis. Asparagus is growing wild in several subspecies from the European Atlantic coast through the Mediterranean countries to western Siberia. It thrives in sandy soil near coastlines. 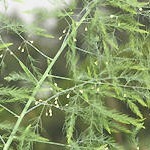 Cultured varieties of asparagus have been grown i horticulture since antiquity. The horizontal rhizome produces sturdy, soft and savoury shoots during early summer. They are delicious raw, or they may be briefly cooked. White asparaguses are obtained by hoeing. After cutting the shoots, the rhizomes soon make new ones, but cutting must be stopped by the end of June in order to let the plants recover. Asparagus is legitimately called the queen of vegetables. 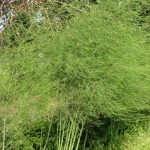 Asparagus sap is rich in the amino acid L-asparagine which contributes an umami character. It was the first amino acid to be isolated (as its monohydrate), in 1806 from asparagus - hence its name. Moreover, asparagus contains some free sugar, and the green, slightly pea-like flavour of raw asparagus is partly caused by 2-alkyl-3-methoxy-pyrazines . The characteristic flavour of cooked white asparagus has four dominant odorants: 1,2-dithiacyclo-pentene, vanillin, 2-acetylthiazol and dimethyl sulfide . 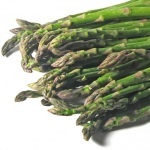 However, the main reason for including asparagus here is the strange phenomenon sometimes called "asparagusuria". Most people observe a distinct and powerful odour from their urine shortly after having eaten asparagus (fresh or cooked). The effect is noticeable very quickly - from 15-30 minutes after the meal. From the viewpoint of a chemist's nose, organic sulphur compounds might be responsible, and this is indeed the case. Waring et al. found the following strongly odoriferous compounds in asparagus-urine headspace: methanethiol, dimethyl sulfide, dimethyl disulfide and 2,4-dithiapentane . Moreover, S-methyl thioacrylate and S-methyl-3-(methylthio)thiopropionate have been detected in the urine. The nature of the biological precursors are still disputed, but a possible candidate is asparagusic acid (1,2-dithiolane-4-carboxylic acid) present in asparagus in rather high concentration. Understanding of the phenomenon of "asparagusuria" has been complicated by observations indicating that not all people produce the smelly derivates, and that not all people, even if they do, have the same ability to smell them . the trees can be smelled at a long distance - a green-balsamic, slightly salicylic and fruity-cinnamic odour. 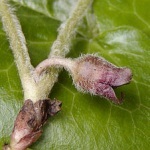 The buds are sticky from a balsam having phenethyl cinnamate (m.p. 67 ºC) as one of its main odoriferous components . The Indians called this balsam 'taccamahacca', and used it for various purposes. 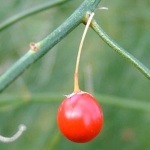 It is still used ('Balm of Gilead resin') in a few cosmetic products. See also birch.